Arrrg... 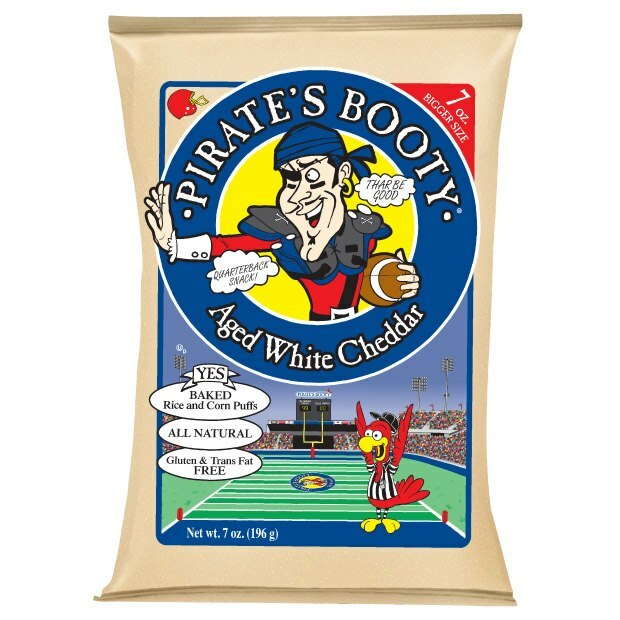 In honor of Talk Like a Pirate Day, Acting Balanced has teamed up with Pirate's Booty to send one lucky AB reader in the US a case of yummy, scrummy GLUTEN FREE Aged Cheddar Pirate's Booty! Robyn was one of the lucky taste testers in our family and she's been enjoying the fun and fabulous puffs that she compares with those day-glo cheese puffs... only way healthier and with a great crunch! It's made with Rice and Corn, and as a mom, I appreciate that it's all natural and trans-fat free, although all the kids care is that it tastes good. Both boys gobbled up their portions too! For those with other allergies, Pirate's Booty is also peanut and tree nut free so it makes a perfect snack to send in as a treat for those in nut-free schools! I was personally impressed with both the taste and texture - since I don't actually like the day-glo cheese puffs, it was great to find something that tasted great and I didn't feel too guilty snacking on! I also appreciate that it's fairly low fat and doesn't have the sodium that chips or other savory snacks often do! Want to try it out with your family? Check out the Pirate's Booty website, visit Pirate's Booty on Facebook or follow Pirate's Booty on Twitter and then enter to win your very own case!